Technology has given humanity many wonderful things: rockets that fly to other planets; machines that scan bodies for illnesses; Jonny 5 from Short Circuit. It’s thanks to technology and the advent of the internet that more employees and workers are working remotely. This YouGov poll suggests 30% UK workers were more productive working remotely, whilst the TUC said the number of people working remotely increased 19% in the ten years to 2016. To the naysayers, remote working remains a cheat’s charter and a license to clock in wearing in your PJs and knock off at 3pm. And, well, for some people it is. But for millions of others it’s an effective way of taking control of your working day and, by extension, your life. I have a location-independent business model and I go away for five days to one-month stretches, with 2.5 weeks the sweet spot. I’m a curious person and it gives me freedom to meet new people in fascinating places. (The chance to avoid those brutal Brighton winters is obviously a huge bonus too!) Despite this somewhat peripatetic lifestyle, I wouldn’t classify myself as a digital nomad: I’m still settled in Brighton (I have a flat here) and use AirBnB and homeexchange.com to get cheap accommodation. Anything with a high must have a low, right? Technical problems are very much all “on you”. Recently my laptop cable just decided to stop working in Trieste – a simple situation to amend when you’re in an office and can borrow a colleague’s, but tricky when you’re alone in a country where you don’t speak the lingo! Solitude can be a problem – you’re having these experiences but if you’re not with someone they can stay in your head. Fortunately, coworking spaces are opening everywhere and are good for meeting like-minded people. Big tip from me? Get a Priority Pass for airports. I never used to get any work done on travel days but now I can settle into airport lounges and get stuck in. I decided to get out of the bubble that is the Alps, but wanted to continue running Altitude Camps – we organise summer camps in Verbier. I chose to work from the UK with catch-up trips back to Switzerland. This is essential to making it work for both sides – with technology we can still communicate really well, look at the same screen and everyone gets my support, but you can’t beat some (occasional!) facetime. A major bonus? I now find that the team use their initiative more, trying to problem solve as I am not just the other side of the office. This develops their own understanding, skill set and allows them to take on more responsibility (as well as saving me time which is a benefit for everyone!). There are some downsides: during peak weeks like New Year and half-term, I am not there to just jump in when things get busy with walk-in clients. I do also miss the social side of being in the office but that’s where PLATF9RM has been really nice*: it gives me the perfect combination of social chat and time to really focus on my own work. I want to tell you a story about cheese. In fact, pretty much anything dairy, and my will evaporates. And so, working at home – close to my fridge – it’s a nightmare. It’s cheese temptation gone mad, because there is nobody there to stop me. There’s nobody there to check my behaviour; to suggest a different approach; to bounce my ‘cheese problem’ about with. And there you have it. For me, working alone, is an unhealthy diet. As a London-based worker, working at home one day a week is a godsend from the commute. Time and again I used to tell colleagues that ‘working from home I get so much more done.’ Now, I can’t cite any research to support the claim I’m about to make, but in my reality, this is a load of baloney. I never used to get more done. Why? Because I see work as a social activity. As human beings we do mimic the behaviour of others. When we’re surrounded by people hard at work; people thinking; sharing ideas; getting excited on the phone, then we like to copy that. And when we’re with other people we can bounce ideas about, enjoy some laughter and, avoid the cheese. That’s my view. As remote working increases – and Chief Financial Officers see the opportunity to drive down costs by pushing more workers into coworking spaces – then remote working is going to increase. This means that the worker who is more aux fait with collaborative technologies – the early adopter – that will be the person that will thrive. That’s why I am throwing myself into coworking and remote working – it’s the work of the future. I've been a self-employed freelancer for the past 14 years. So self-directed remote / mobile working is the only real model I know now, and to be honest, I'm not sure how well I'd function in a more conventional office environment. The Rough Agenda and the BrightonSEO team is built on this way of working, partly as it began as a sideline project itself, partly because it's fairly common in an event industry context, and also very much as a conscious decision by the MD about the way he wanted things to run. There are loads of benefits; the team all balance the job with other work commitments, activities and/or childcare. It enables commitment from a skilled and experienced core team who might not be able to attach themselves to a more conventionally structured project. When people are empowered to take responsibility, it also creates a real sense of shared endeavour in it all - which is really what we're all after at the end of the day. There are some challenges of course. Ambiguity of responsibility can be a problem, and everyone needs to accept that the odd thing is going to fall between the cracks. Also, some people find it an easier model to work with than others and you can feel isolated from time to time if you've not spoken out loud to another grown-up all day! Despite an increased discourse around women’s rights, our world is off-kilter. The theme for 2019’s International Women’s Day is ‘Balance for Better’ and it will highlight the benefits of a society that encourages balance and diversity: from its boardrooms to its sports teams, its media and its governments. The gender pay gap is a totemic indicator of our unbalanced culture. In the UK it is around 20% across sectors, with the World Economic Forum predicting it will take 217 years to close the global gender pay gap. Dr Zara Nanu is the CEO of Gapsquare, a tech company that analyses companies’ gender pay gaps, then offers pragmatic steps to fix them. Since forming Gapsquare in 2015 she’s analysed over 270,000 employees’ salaries and worked with the likes of Vodafone, Condé Nast and Greater London Authority. We called her to discuss how small companies can take an axe to their gender pay gap. (Or, better still, stop one developing in the first place). Hey Zara. Why are small companies so important in the battle against the gender pay gap? Smaller companies are in a unique position because they can set the tone. Larger companies take years and years to make a change. Small companies can change things quickly and I think the success in eliminating inequality in work will come from SMEs. They’re smaller, more agile and have real opportunities to make changes. It’s about developing strategies that create inclusivity and diversity, about being more aware and transparent. What are the benefits of making all your salaries transparent? News travels fast about salaries, especially for small companies. People looking for jobs are increasingly checking out Glassdoor to see how much companies are paying. It’s very easy to find out how much others are being paid. A good move would be to stop specifying ranges in salary. So a company might be advertising for a management role and say that the salary will be “between twenty-five thousand pounds and thirty thousand pounds, depending on experience”. But what normally happens is you get more men at the top end pushing it up, and more women at the bottom end, accepting the lower amount. Should we stop asking people about their previous salary? Nine American states have now banned this practice. Yes, this is an easy move. When you ask someone their salary, you’re more likely to offer them something along similar lines, but with a small increase. There’s a higher chance of this negatively affecting women because they historically have lower pay. The issue of childcare is central to many people’s ideas around pay. What about offering shared parental leave, like Sweden? This would make a huge difference – in Sweden, the uptake for parental leave is high for both parents. But it’s taken them 30 years to get there because it takes a cultural change. It’s relatively easy to alter company policy – you know, change the document and say everyone is entitled to parental leave. But in practice, what we’ve heard, is that men asking for this leave can have their ambition being questioned. So it’s about changing the way we view parental leave and our attitudes towards it. Absolutely. Subsidised childcare seems like a big ask because we’re thinking like a business owner and it’s an additional cost. But if you look at the increased financial return of that person, it will outweigh the cost. Superficially it looks too costly, but it makes financial business sense. How can we attract more women at the point of entry? A lot of jobs – say something in construction – are perceived to be suitable for certain types of characteristics. Perhaps ones we historically associate with males. It’s about rethinking how we hire people and the processes within that. We recommend that hiring happens without knowing names, ethnic background, or even the university they attended. These can all influence decision-making. What would you suggest for a company that’s getting a high percentage of men applying for a role? There’s a free app called Gender Decoder. You run your new role through it and it will tell you if it has a male-male-dominated language or a female-dominated language. You can then change to make sure it’s neutral, or if you wanted to make it more orientated towards women, you can do that. It’s free. That’s the easiest thing for small companies. If you want to ensure you’re tracking your gender pay gap from the start, Gapsquare have free online tools for small companies. And how can companies ensure there are more women progressing into the more senior roles? Research is showing that if you have a shortlist of four for a role, it’s not enough to just interview one woman. You need a 50/50 shortlist. Although these changes are obviously positive from a societal point of view, some owners might find them hard to comprehend. What are the business benefits? There’s a lot of research that says people who work flexibly and fewer hours tend to be more productive. People who work in a transparent environment tend to be more productive. And people who work in more diverse groups usually generate more return for the company. And what can individuals do? A freelancer, for instance? It’s about being aware of the importance of these issues. 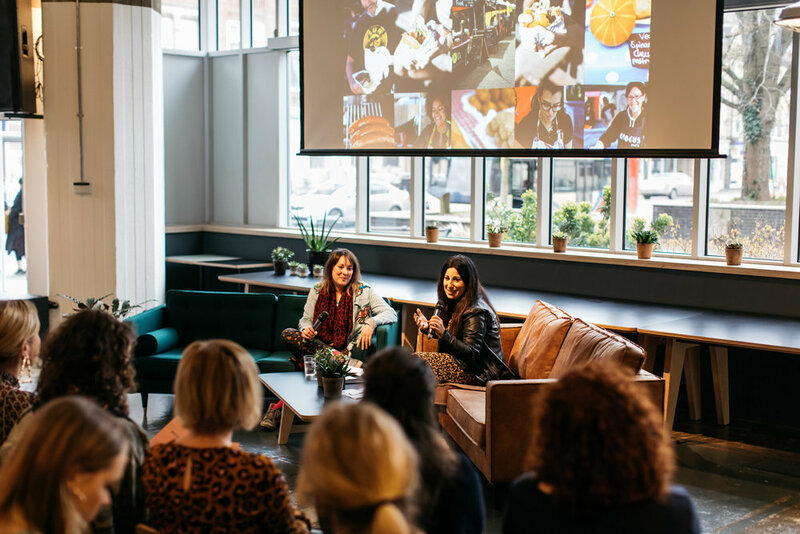 If you want to grow your business and eventually support a team and their work, then you need to be aware of diversity and inclusivity from day one. Because it gets to a point where culture becomes entrenched in an organisation. It’s then much harder to change. Leon Taylor knows about dealing with stress. After diving in three Olympic Games for Great Britain, peaking with a silver medal at Athens 2004, he’s reaped the rewards of pushing mind and body to extremes. Sports fans may now recognise his ever-excitable voice from Olympic diving commentary, while he’s developed careers as a coach and mentor, Tedx speaker, yoga teacher, author, and mental wellness advocate. Hey Leon. You work a lot with business figures. What’s the biggest problem you are encountering? Across generations, there’s a growing concern about mental wellness. There’s many reasons but not dealing with stress effectively is causing lots of people to develop anxiety, depression and other more serious health problems. We need to create resourcefulness. To interact with and define stress in a healthy way. Why is it important to “define” stress? There was some research recently about the perception of stress. It was undertaken with 30,000 people over eight years – it found that if you perceive stress as harmful then you will get the harmful effect. Those who believed the stress is harmful to them had an increased 43% chance of premature death. But the ones who reported the equal amount of stress but believed it wasn’t harmful, were in the lowest chances of premature death! So we really need to work on our beliefs and strategies around stress. This is especially true for entrepreneurs and freelancers, where overwork and business stress can feel like the norm? Entrepreneurs can often be the worst! They’ll be thinking, ‘If i don’t start this business, no-one will’ and run themselves into a hole. Here’s an interesting fact: if you have less than five hours sleep for a week, your performance would drop to the level as if you’ve had 48 hours of no sleep! But you won’t know because you’ve just been ploughing on. Obviously we have occasional periods of intense business or things happening outside of our control – a new child, for instance – but choosing to live like this on a regular basis is crazy and actually negates your business effectiveness. Without a foundation of wellness, high performance can’t exist. Yes, the short term effects of moving are more obvious – it gets you out of that fug, gets you moving and gives you those feel-good endorphins. But long-term it changes the shape of the hippocampus in your brain, where thought and function occur. By exercising, you’re actually improving the structure of your brain. It’s hugely powerful. What would you say to the working mum or dad who says that they can’t find time to exercise? Exercise and movement are different. People think it’s got to be going to the gym, or a run, and it’s got to be 45 minutes. But five minutes of burpees is actually much harder than 45 minutes of running. If you can’t do burpees, do squats. If you can’t do five minutes, do two. It’s about starting small and making the habits sticky. And everyone has different things that work for them? Absolutely. Some people might need quiet time: two minutes of mediation in the morning, perhaps. It’s often discovering what you can do. They might not be able to go to the gym so try walking into work rather than getting the bus. It could be cycling to see your mum. It could be dancing, or raving! There’s an epidemic of business people saying they’re too busy to look after their wellness. It’s about making positive habits so easy they can’t fail. How did you deal with the stress and anxiety of an Olympic dive? That’s an extreme example of anxiety and pressure and we did visualization hundreds of times. You visualize yourself smiling and relaxing on the stage, plus the sights, smells, crowds and everything else, so when the event happens it’s not unfamiliar. You still have to deliver but other factors aren’t going to affect you at the time. It’s about trying to stay calm, and ensuring your body doesn’t fall into a negative anxietal state. When this happens, your body hijacks your nervous system and you go into fight-or-flight mode. If that happens you’re in serious trouble, so you need to work beforehand to ensure your body doesn’t enter that state. This is especially relevant to business people doing presentations or pitches. What can they do to stay in a positive mental state? Absolutely. So it’s about making sure you’re breathing deeply before stepping up to make the presentation. You’re smiling and nodding. You’re telling yourself that it’s okay; that these people are just humans. Whatever you need to do, so when you go into the performance setting you can get out of your way and let it happen. And being fit through regular physical movement will help you achieve this? Finally, what’s happening with your Bare Biology collaboration? The founder of Bare Biology, Melanie Lawson, reached out to me last year. She’d had some personal issues and could feel her physical and mental wellness slipping the wrong way. She saw my Ted x talk on finding your movement and asked me to help, so we documented the process. It’s all about habit changes and making these changes sticky. Mel got into running and she’s now running the Brighton half marathon! She’s a mother-of-three, business owner, never done a long-distance run, so I think it’s a powerful story. We’ll be reflecting on all of this at our event, and I’ll tell some stories from my own career. I can’t wait! ‘Movement For Mental Focus’ will be taking place on 27th February, at PLATF9RM Tower Point RSVP here. Check out Leon’s website here.